Malawi Revenue Authority - "Verify before buying vehicles"
Malawians have been advised to always make prior verification with the Malawi Revenue Authority (MRA), Directorate of Road Traffic and Safety Services (DRTSS) and Malawi Police Service (MPS) before purchasing a motor vehicle even if the vehicle is bearing a local registration number. This is because sometimes the vehicle may have been stolen or smuggled into the country. The Secretary to the Treasury, Mr. Ben Botolo, said this recently when Capital Hill witnessed the signing of a Memorandum of Understanding (MoU) to interface operations systems involving MRA, DRTSS and the Police. The signing took place at the Ministry of Finance and Economic Planning & Development headquarters and it was presided over by the Secretary to the Treasury himself. MRA Commissioner General, Mr. Tom Gray Malata, Director of Road Traffic and Safety Services, Mr. Fergus Gondwe and the Malawi Police Service Deputy Inspector General (Administration), Mr. John Nyondo, led their respective teams to formalise the tripartite working relationship. The MoU facilitates the interface of Malawi Traffic Information System (MalTIS), ASYCUDA World, Msonkho Online and Interpol 24/7, further cementing an already existing working relationship among the three public institutions. 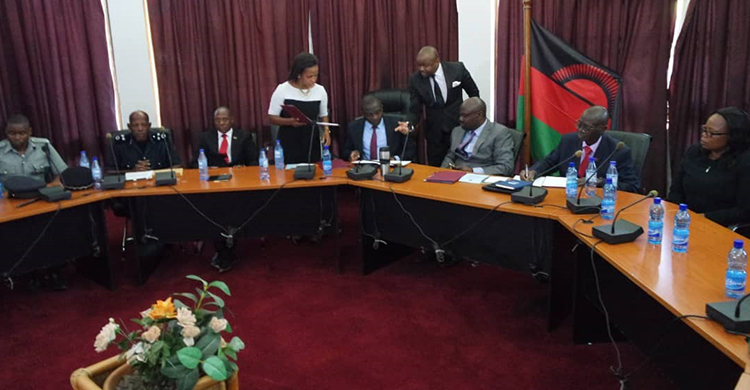 In his address, the Secretary to the Treasury said the MoU will heighten improved service to the public while at the same time ensuring that there is order in the importation and registration of vehicles in Malawi. “Motor vehicle smuggling has resulted in huge loss of revenue. We all know there is huge demand for social services and development projects from the people of Malawi such as bridges, roads, schools, hospitals and others. All these need financial resources. “Through this MoU, the three institutions will enhance their cooperation and share data [real time] which will be used to detect such fraudulent acts and easily recover revenue from smuggled motor vehicles with dubious registration number plates,” observed the ST. He emphasised that the working relationship between the MRA, DRTSS and the Police had already started bearing positive results with a recent joint operation leading to seizure of 47 smuggled motor vehicles. “This operation enabled the three organisations to recover over K500 million. Surely without good working relationship among the three institutions this revenue would have been lost,” he observed. In addition to protecting loss of revenue, the MoU will enable the three institutions to provide quality service to businesses and the general public thereby encouraging lawful clearance and registration of motor vehicles. The Secretary to Treasury, therefore, advised Malawians wishing to purchase motor vehicles on the open market to always verify with MRA, DRTSS and the Police if indeed the motor vehicle was legally registered. In a media interview, the Commissioner General said the Authority is very committed to sustaining the working relationship with DRTSS and the Police as formalised by the MoU sentiments. The Deputy Inspector General of Police said the MoU will also ease their work when issuing Police Clearance Certificates, sentiments which the Director of Road Traffic and Safety Services echoed. This service is to assist a tax payer/third party in validating and authenticating either a Tax Clearance Certificate or a Withholding Tax Exemption Certificate by comparing what is stored in our records. This service is to assist a tax payer/third party in validating a Form 12 customs document. This service is to assist a tax payer/third party to submit thier KYC forms to MRA from processing. © Copyright 2019 - Malawi Revenue Authority.